In a medium-sized mixing bowl, cream together the butter and brown sugar using a hand mixer or a wooden spoon until the mixture is well blended. Add in the vanilla, milk, salt, and cinnamon and mix until just combined. Add in the oat flour and stir until just combined. Eat immediately, or chill until cold, then enjoy. We swapped out traditional all-purpose wheat flour for oat flour, which is safe to eat without baking. Oat flour can be found in the gluten-free baking aisle at most major supermarkets, or you can make it easily at home. 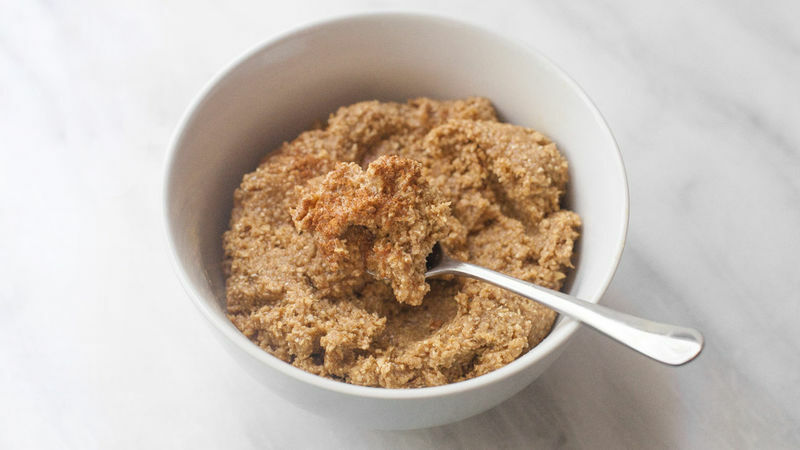 To make 1 cup of oat flour, take 1 1/3 cups of old fashioned oats, and pulse them in a high-powered blender or food processor until it resembles a fine flour. This isn’t a job for your stand mixer. Because of the small volume of dough, you’re better off using a hand mixer or a regular spoon.